Friday April 16-Monday April 19 2010.
train and Bob made his own way from parts northern. A cold night, certainly frosty and a reported -3C. displeasure at this state of affairs. Another late finish for some – others made it to the café before closing. warmer, due to the cloud-cover, night. ‘Yo-Ho Crack’ and ‘Tar’s Arete’. with construction site ambience was reported. was followed by loading kit for four, and four people into Andy’s car. ‘Gear-shop (Direct)’ was followed by ‘Tea & Cake’ and an easy journey home. and an excellent start to my 2010 season. assisted in the cobbling together of this article. This entry was posted in Old articles on 03/05/2010 by other. Or Why do they always have such bad years? four main areas: strength, stamina, flexibility and coordination. will be seen in the development of that all-important “one-pack”. paraphernalia through thigh depth snow. Build to buying a few presents for …..
other smeared on a nearby wall. you are clearly identifying with the climbing community. people stop going away camping over the winter season. This entry was posted in Old articles on 04/11/2009 by other. A team of Martin Hore, Steve Culverhouse, Sheila Norman, Mike Bayley and I gathered at Jesse James’ bunkhouse on the evening of Tuesday 30th and settled in. Guidebooks were consulted, plans made and forecast checked. It was certainly cold and clear during the night. A reasonably early start on Wednesday saw Martin H. and Steve head off to Cwm Glas for some kind of ice-adventure whilst Sheila, Mike and I packed for a go at the Snowdon Horseshoe. The merits of walking axes and crampons were considered and fitting your crampons to your boots before setting off proved challenging for Mike but fortunately a spare pair were available that could be made to fit. Eventually, however, we made a departure for Pen-y-Pass, having heard from Ian Thurgood and Christina Ennis (and Monty) that, ‘there’s lots and lots of fog on the motorways, so we might be later than anticipated’. Off to Pen-y-Pass and up the PYG Track. Brilliant conditions – an almost cloudless blue sky, any mud firmly frozen solid and very little wind. We enjoyed a leisurely scramble over Crib Goch, taking in all the pinnacles and the splendid views. A pause before Garnedd Ugain and its easy scramble and then the grind up to a very busy Snowdon summit. The descent down to the col between Snowdon and Lliwedd proved as ever an unpleasant affair but the excellent easy scrambling over Lliwedd made up for that. The descent from Lliwedd was in the shade and decidedly colder than it had been on the sun on the ridge. Back on to the Miners Track at Llyn Llydaw and Mike spots ‘a tall man, a short woman with an ENORMOUS rucksack and a dog’ and suggests that could be Ian, Christina and Monty. We walked quickly to try to catch them but to no avail and at the carpark Mike was proved right. Back to the bunkhouse via shopping in Llanberis for us, off to their campsite for Ian & Christina. With the falling light temperatures quickly dropped and by the time we got to the bunkhouse it was decidedly ‘blurry cold!’. A very jolly evening was had, except by Monty who had to stay in the car. Port and cheese was served and Martin H’s laptop was pressed into service for an impromptu slideshow of the day’s digital pictures. Very cold overnight but a super days weather ahead. We all tackle Sentries Ridge And Continuation, a Grade 2/3 *** scramble on Mynydd Mawr to the West of Snowdon. Excellent cloudless blue skies and a heavy frost but no breeze and the sunshine pleasantly warm. An easy woodland walk-in (during which we obeyed the roadside sign not to feed the bears) led to a hillside traverse with some wall and fence hopping before a scree-traverse to the base of the buttress. Ian and Monty chose an easier line to the summit, Steve, Martin H. and Christina made up one rope and Mike, Sheila and I another. Good, exposed scrambling on some suspect rock (various cries of ‘BELOW!’ at various points as loose bits detached, and one of ‘EEEK! Fuggit!’ as Christina proved that volume is not necessarily directly related to size when she fell off. Very pleasant exposure and a couple of tricky bits, some good pinnacles and a section of unprotected loose horrors, and a lot of fine ridge work and we were at the summit. An easy walk off and back to the bunkhouse for tea and cake – or back to a frozen tent for the campers and a splendid day out complete. A jolly evening with port and cheese and another impromptu slideshow. The early start thing proving habit forming, we made another early start. Steve and Martin H. headed off in search of more ice, Ian and Christina went walking to the west of Snowdon and Mike, Sheila and I drove to Bethesda to tackle Crib Lem, a Grade 1 *** scramble. Not such fine conditions – windier, cloudier and although the air temperature was higher it felt much colder. A leisurely walk in with Mike tackling the map-reading. A drinks pause and then up onto Crib Lem. A slog up a steep scree path and then onto the ridge. Good scrambling over pinnacles with some of the more challenging bits avoidable. Up onto the Carnedd Dafydd ridge and onto the Carnedd Dafydd for a spot of lunch in the ice-rimed shelter hoping for a view should the clouds break. We then backtracked a bit before walking up Carnedd Llywelyn and onto Foel Grach in thick cloud and a strong crosswind. A steep descent took us on a bearing off the top and right on target to our intended checkpoint before hitting the valley floor and the walk back to the car. Fortunately the ground was frozen hard or it would have been an unpleasant mud-fest. Unfortunately we had to consider a stream crossing, but the risk of iced boulders and the amount of water in the stream made crossing impractical so we took a longer way back than perhaps we’d have liked although we still got back without needing to resort to a head torch. Another jolly evening featuring the never-ending supply of port and cheeses and another slideshow. Another early start – don’t these people understand the idea of a lie-in? Mike had picked up a cold and very sore throat so decides to head home straight after breakfast. Ian, Christina and Monty decide to walk up Y Garn whilst the bunkhouse team have a go at Y Garn East Ridge, a Grade 2 ** scramble. More excellent conditions, blue skies, sunshine and everything frozen solid. Walking up from Ogwen Cottage we pause to wander carefully onto the froze Llyn Idwal before tackling the ridge. 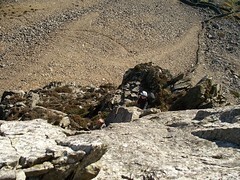 Grand scrambling with spells in the shade to let us relish being back in the sunshine again. Some exposed sections and a couple of places of difficulty but grand scrambling in a dramatic setting. All too quickly we’re on the summit ridge and head up to Y Garn summit where we meet up with Ian & Christina and have some lunch. We walk on to Foel-goch where Ian, Christina and Martin H. choose to head back to Ogwen and the parked cars. Steve, Sheila and I continue to Carnedd y Filiast, pausing on the way to peer down Atlantic Slabs – it looks like there’s some excellent slab climbing to be had there. From the top of Carnedd y Filiast we take an off-path route aiming for the bunkhouse. Fortunately the ground is again like iron or this would have been a real test of boot waterproofing and sense of humour. It wasn’t a challenging walk back apart from finding footpaths (all fortunately frozen solid – it would have been a long session of wading through mud otherwise) in the failing light but it was interesting to see a different view of the area. Back to the bunkhouse and well earned tea and cake. Supper ensues, Ian and Christina joining us. A last go at port and cheese and another slideshow. Travel home, pausing at Betws-y-Coed in pursuit of new boots for Steve C – he left Ipswich with about 85 pairs and returned with more. This years LOTY awards ceremony was held at the prestigeous Masha restaurant, and was compered in verse by Martin Hore. This year the judges introduced a brand new SI unit of measurement that combines the number of lobs with the number of guidebook stars. This new unit has been unofficially christened the “lobstar”. The winner of this years LOTY is the man who confined his lobbing to two of the finest three star routes on Peak Gritstone, amassing an unassailable total in just one weekend of no less than 21 “lobstars”. Yes, it’s got to be – Guy Reid! You can the full transcript here. The winner of this years award is, once again, Steve Culverhouse for his work on ‘The File’ at Higgar Tor. The master of ceremonies was Peter Krug, whos speech may be read here. You can read a full transcript of the awards ceremony, written by Peter Krug. You can read a full transcript of the awards ceremony, written by Martin Hore. Martin opened his awards speech with the lines … “In revenge it falls this year to me to take on the mantel of judge, jury, chief prosecutor, private investigator and raconteur”. Awarded to Martin Hore after “highly dubious decision making by one of the most biased juries ever to deliberate on behalf of the IMC”. There is no transcript of this award ceremony, which was frankly a drunken ramble. The winner of this years LOB of the Year with an early start to his young climbing and Lobbing career … Chris Harbottle. For a full transcript of the awards ceremony, click here. The winner in 2001, for the style in which he lobbed, the location in front of twenty or more bemused onlookers, the equamity with which he handled the event and, most importantly, for the spectacular effect on the belayer who was hauled forward by the momentum and ending up kissing the rock, has to be Dave Tonks. For a sterling effort to reduce his leader’s lobbability by running backwards, like all good belayers should be prepared to do. The Belayer of the Year goes to our illustrious President Steve C.
For his impeccable ability to pick out what must be the narrowest of landing places the Newsletter Editor has ever seen in his years of climbing, and he probably will never climb with me again because of this, Lob of the Year 2000 goes to Mark G.
“One nice large Hex for protection, then a dyno for a small hold on the adjacent slab. The heart flutters whilst the finger grip holds but then slowly uncurls. Quick shouts of ‘take in, take in!‘ are followed by the fall, inverting en-route to end up with the Gearman’s head at waist level”. The excuse produced afterwards was that he was just re-introducing Mark to leading and wanted to show that lobbing was perfectly safe. So the winner this year by a short head: proving that he’s equally adept on both the limestone and gritstone is:- Keith L.
This year’s runner up, for participating in the highest number of lobs this year, is the Isle of Lundy. As the Island couldn’t make it to the award ceremony – a good job, or there would have been no room for the rest of us! – Clare P. collected it on its behalf, well, she seemed so attached to a small part of it. The decision for the main prize this year was a foregone conclusion. He has the style and determination to carry on lobbing when others might have decided to stay on, has made the motto “been there, climbed it, fell off it” his own, this year’s winner – Steve C.
The out-and-out joint winners in this new category are obvious. This team has been out there for the last couple of Scottish winter seasons – I hesitate to use the term ice-climbing, given what they’re actually going up. More recently they followed in the footsteps of the master, Mick himself, by attacking the chalk cliffs of the South Coast, and defending themselves as the cliffs fought back! – it’s the ice axe twins, Keith B. and Mike J. The star of this tale was climbing with Jenny M. and John P., on “Beeston Eliminate”, a multi-pitch HVS at Beeston Tor, in the Peaks. The 3rd pitch of this climb is a 22-metre traverse, starting with a difficult step down and across. Jenny led across, protecting the pitch entirely with threaded wires. Our heroine went next and had just started the step down when she found herself unable to hold on, quite a serious position, as she was about 15ft from the next runner and level with it. “What now?” she shouted as her fingers slipped off the hold. “RUN!” was John’s advice. And she did, executing a neat semicircular trot down, across and up the other side. Then back again, and again, in a series of diminishing arcs until finally coming to rest. An exciting pendulum for the spectators (and participant), and notable for the elegance of execution. So for her antics seconding at Beeston Tor, this year’s winner is Carol F.
Combined with his efforts in previous years, Tim B. has now racked up enough air miles to gain his pilot’s licence, although the committee recommends that he give up on the low-level aerobatics and concentrate on vertical distance rather than horizontal. Well, this year’s winner has certainly made his name, so now it’s time for him to claim his “glorious hour”… For being one half of the synchronised lobbing team, and for his well-publicised activities elsewhere, Lob of the Year 1996 goes to the club’s star of stage and TV screen, Martin H.
This was the year of the Club’s Spanish “El Lobbo”, the French “Le Lob” and the lack of a German “Der Lob”. This apart the coveted prize goes to joint winners Mark S. and Claire P. for their combined antics at Stanage Edge. This year’s Belayer of the Year prize has to go to another newcomer, Keith L., for his method of belaying demonstrated one evening on Curbar Edge. He put the rope through the belay plate and attached the karabiner. He then calmly unzipped his fly, reached in with the karabiner, clipped to something, and started belaying. Very cool Keith, but what’s the breaking strain?! This year, despite a severe cooling off at the end of the season, there could really be only one winner. For his fine efforts on Kinder, and his great route-finding on “Slippery People”, this year’s Lob of the Year goes to Tim B. The judges took a long time deliberating over this, but, after consulting the rule book, they decided the winner was Steve J., for dropping Scott McR. in Tenerife and dropping himself (on abseil) in Spain Perhaps next year he’ll be in action in this country. The judges were undecided between the merits of pure distance, against injury, against overall performance throughout the year. In the end, consistency won the day, which made the prize almost uncontested. He’s lobbed in Staffordshire, he’s fallen in Derbyshire, he was involved in Wales – for a gutsy performance, when he just never gave up, this year’s Lob of the Year goes to Peter H.
This entry was posted in Old articles on 05/12/2008 by other. Way back you may remember an article from Madame Pres in which she described the satisfaction gained from teaching two beginners to “trust their feet”; well I was that soldier . . .or at least one of them. It seems appropriate, especially now that she has stepped down, to thank Caroline for all her support, sarcasm and endless patience at the other end of the rope while I did, indeed, learn to “trust my feet”. Now that I’m beginning to get the hang of this leading malarkey, I might even try to “push my grade” soon . . . well, maybe. Thanks also go to all those other brave souls who have assisted me (and hopefully will again), and to Mike Hams for the many embarrassing photographs – yes, I know you’re laughing at me not with me! This entry was posted in Old articles on 04/12/2008 by other. After spending the morning doing nothing in particular we left the car at the Cairngorm funicular car park and set off towards Coire an Sneachda with plenty of enthusiasm, rucksacks the size of washing machines and the latest and greatest in snow-relocation technology (straight from the garden shed). Of course, we got the occasional, “Bit late to be heading up, isn’t it?” looks from the parties heading back to the car park but we brushed them aside with a nonchalant chuckle. They were probably going back to some pink, fluffy bunkhouse to paint their toenails! Wimps. 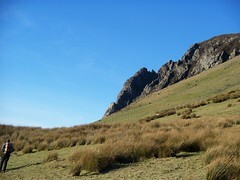 We plodded on, hopped and skipped through the corrie, zoomed up the Goat Track at the pace of a thousand raging (racing?) tortoise and dropped into a pleasantly misty Coire Domhain. Wild conjecture to the fore we now had to decide where to site our snow hole. I believe I was quickly running through the finer points of Brigadier Sir Chimley-Glawson’s 1925 theory on snowflake cohesional differentials in a rarefied atmosphere at the moment the mist cleared enough to spot a dark shape not 50 yards into the corrie. “That’ll save some time,” we thought, recognizing what it was. Feeling slightly on the cheaty side, not actually having to dig our own snow hole, we set about at least tidying it up a bit. I thought we actually finished up with quite a respectable porch, which is a shame considering that it was largely demolished by an arse on ingress. There was still a few hours light left and the weather was glorious. Crisp, bright, artistically hazy and with brilliant views over the Cairngorms. We took a wander towards Loch Avon, enjoying some textbook trouser-seat tobogganing on the way, before heading up towards the top of Coire Lochan for a good view of the sunset. So ideal were conditions that we walked back to the hole in our footsteps from earlier. You see, snow holes, however much fun they sound, are a pain. You can’t move without getting wet something you don’t want to, in fact you can barely move full stop unless you’ve built a veritable palace (as opposed to our modest offering). And we’d forgotten to bring biscuits thus sullying the entire experience and heavily biasing me forever more against our icy, Hobnobless abode. In their defence, they are warm and offer excellent shelter from the wind and we managed to enjoy supper in relative comfort. However, come morning the roof will have sagged sufficiently to nigh on pin you to your sleeping platform and will start dripping on you just as you want to get out of bed. The Chinese were onto something with that water-torture business – the dripping is truly maddening. We ate breakfast outside; out being infinitely more pleasant than in. It’s not impossible, or even difficult, to snow hole; just annoying. I’m afraid the novelty wore off quite quickly and, in this case anyway, the problems far outweighed the benefits. We were glad to have done it but mainly so we can tick snow holing off our lists of things to do. Maybe a more remote camp with some far-flung objective in mind would make it worthwhile. Would I snow hole again? If you’d asked me at the time I’d probably have said something sarcastic with an overall, “Not bloody likely!” feel to it. I’ve now had all summer to forget how much I disliked it so could quite easily give it the benefit of the doubt and have another go (the season is nearly on us after all). This entry was posted in Old articles on 03/04/2008 by other. Though I had studied the guidebook for the area carefully beforehand and had marked some suitable – or so I thought – 1st leads, the masses of climbers present at that day’s chosen venue, The Roaches, meant that I didn’t actually succeed in leading anything that day. I still managed to second several nice routes, though, and enjoyed some great climbing. So, lucky nuts dangling unused off my harness, I retreated back to the car that evening, feeling a mixture of disappointment at not accomplishing my objective for the day and (ok, I admit it only to you) a little relief at not having had any difficult lead situations to deal with, as, of course, I wasn’t nervous about my first proper lead AT ALL. True to Staffordshire spec, the next morning dawned a bit grey and breezy. And things were to get worse… No more spilt milk actually, but Johnboy announcing cheerfully that the chosen venue for our group for the day was in fact Hencloud, as he wanted to meet up there with Nick, who – since leaving the flatlands of Suffolk for sunny Sheffield in the summer – is now a “crag local” (who said we’d be bitter??). Well, the routes at Hencloud have a reputation for being hard for the grade, the whole crag is much more exposed and there aren’t more than a handful of easy routes. So I mentally prepared myself for a day belaying and bonding with my duvet jacket. A quick check of my pack produced some much-needed sustenance and a can of Red Bull. I can only put it down to this liquid refreshment (and, ok, a little more bullying from Clio) that I soon found myself gearing up to lead “The Arête”, a superb looking 30m long HVD***. Well, what can I say: while Clio belayed me, Steve soloed up beside me to give hints and moral support (which was MUCH appreciated), I placed every bit of gear I had and then some, thoroughly enjoyed the experience and finally topped out with a big whoop. What a feeling! Having set up the belay I quickly brought Clio up. 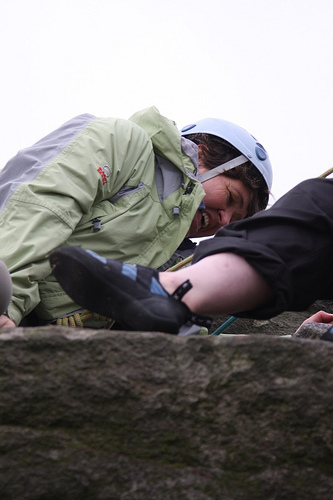 I am certain that by that time she well and truly regretted her earlier persistence as she had got quite cold belaying me and was now having to take my rather well placed gear out as well. Luckily, the stiff breeze took all swearwords, which might have been muttered, away before they could reach my delicate ears. Seeing as my grin went all the way round my head at that time, I probably wouldn’t have heard that well anyway. Eventually Clio joined me and Steve, we broke down the belay and set off down the crag – the perma-smile still plastered across my face and the lucky nuts dangling happily off my harness, this time used and abused.